Address: Montaña Roja, Parcela 42, Playa Blanca (Lanzarote), Islas Canarias. 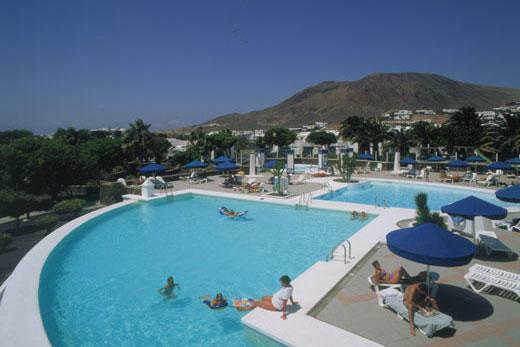 Set in Lanzarote’s Playa Blanca, Marconfort Atantic Gardens Adults Only - All Inclusive is an exclusive complex that offers a swimming pool with climate control, buffet restaurant, snack bar, free WiFi throughout, and fitness centre. Featuring a typical Canarian décor, this complex offers bungalows with a private terrace with outdoor furniture, and living space with a sofa bed, safe, and flat-screen TV. The bedroom comes with 2 single beds and a private bathroom with a shower. There are many activities you can practice at this hotel, including mini golf, tennis, and volley ball. There is a gym and solarium available, and guests have access to a sauna for an extra charge. The buffet-style restaurant serves international dishes, and it includes a terrace for al-fresco dinner. There is also a snack bar offering drinks and cocktails, and you can enjoy live music at night. Please note that the full amount of the reservation must be paid upon check-in. Please note that all inclusive board basis include: - Breakfast, Lunch and Dinner at the buffet restaurante with show cooking; - Snack service; - Soft drinks and national alcoholics at the hotel bars, from 10:00 until 23:00; - Cocktails selected in chart; - 50% discount in international drinks and black labels; - 30% discount in wines chart; - Selection of teas and coffee at the room. When booking more than 3 rooms, different policies and additional supplements may apply. Please note that the bungalows are cleaned every 3 days. Please note that guests must present the credit card used to make the reservation on arrival. If you are not the owner of the credit card used to make the reservation, you must provide a copy of the credit card, a copy of the passport, and signed copy of authorisation from the cardholder for the total cost of the reservation. Please note the published rates for half board stays on 25 December include a mandatory fee for the gala lunch held on that day. Please note the published rates for half board stays on 31 December include a mandatory fee for the gala dinner held on that evening.